AgroAtlas - Relatives - Bromopsis variegata (Bieb.) Holub - Variegated Brome. Bromopsis variegata (Bieb.) Holub - Variegated Brome. Family Poaceae Barnhart, genus Bromopsis Fourr. Zerna variegata (Bieb.) Nevski, Bromus variegatus Bieb. Perennial plant 40-60 cm tall, forms mats. Sheaths glabrous, entire or decomposing into parallel fibers, not reticulate. Leaves usually glabrous, less often weakly hairy above, flat, 4-5 mm wide. Panicle about 5-7 cm long, erect, very compressed, with short branches. Spikelets dark violet-striped, 5-7-flowered. Lemma with straight awn, 5-10 mm. 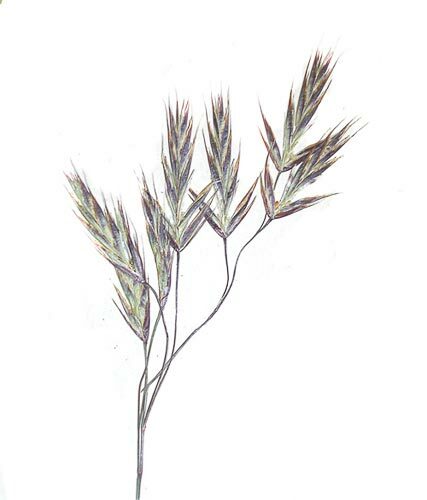 Spikelets pubescent (var. pubescens) or glabrous (var. lejantha). Cross-pollinated anemophilous plant. Flowers in May, fruits in June. 2n=28. Occurs in high montane zone. Forms subalpine and alpine meadows. One of the best forage plants of subalpine and alpine zones of the Caucasus. Winter-hardy and quite drought-resistant. Brezhnev DD., Korovina ON. 1981. Wild relatives of cultivated plants of the USSR flora. Leningrad: Kolos. 375 p. (In Russian). Rozhevits RYu., Shishkin BK., eds. 1934. Flora URSS. V.2. 778 p. (In Russian).